Incus Power Ltd provides energy analysis through smart power metering and energy management reporting software . With Energy costs rising dramatically and environmental regulations tightening, the pressure for industrial and retail companies to reduce energy consumption is increasing. For large energy consumers the compilation , maintenance and analysis of energy data is a essential management process. Our Data Management & Reporting provides effective solutions to track, analyze, and report on your energy and environmental data. Our energy reporting services help organizations reduce administrative costs, improve energy management capabilities and build confidence in the accuracy of reporting across an entire portfolio. Our Data Management & Reporting services establishes a foundation for budgeting, financial planning and cost monitoring that provides an effective response to today’s complex energy challenges. Data Input & Bill Validation (Advantage Reporting) – recording, analyzing and reporting on your energy data is essential to monitor costs, consumption behavior and ensure anomalies are caught. Data Input & Bill Validation services offer a premium solution to monitor your energy data in a secure, reliable environment that prepares your organization for future importance of tracking your data. Reporting & Communications Strategy – as part of an overall energy sustainability program, which leverages E-mail and Synchronized database reporting capabilities, provides a comprehensive score card of energy data and results tailored to your specific internal and external reporting and communications needs. Various comparison Reports as detailed below. Alarms on Peak Demand and anomalies. Analytics – combining a comprehensive approach with our energy and environmental expertise to identify opportunities for cost savings, efficiencies and alternative approaches to managing the complexities of your energy data. – Consumer reports: Several usage meters can be grouped together in to one department. As such Refrigeration, Motor, Lighting can be defined as a specific consumer. The consumer reports are graphic reports which show the usage of a certain department. The user can also select the time period for each group of Loads. Line or bar charts can be selected. These reports can be used to trace abnormal peak usage, to eliminate abnormal usage and for example to evaluate if reduced night or weekend shifts makes sense, considering the higher energy usage per unit Area. – History reports: This set of reports shows the energy usage for a specific Piece of Plant, for a machine type, for a department or for the whole facility over a longer time period. 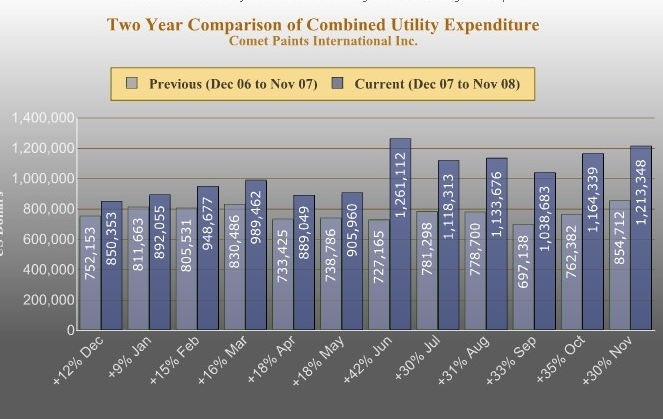 These reports allow evaluating the energy component in the overall running cost of each department. Does the energy usage remain constant when certain environmental conditions change or is there large fluctuations, which require further analysis? – Trend reports: These reports allow management to analyze the energy usage over different time periods, such as per week, per month and per year. Energy usage trends can be selected for a specific type of process, a specific style or product, a specific department or the whole plant. 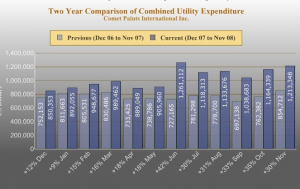 – Combination reports: In these reports energy usage is related to effective Storage. For example in the refrigeration process energy usage is reported per Storage Area utilized. The use of regression analysis reports allows the determination of relationships between Storage Area utilized and energy consumption.